Biostasis.com is the world’s largest independent website about cryonics and medical human biostasis. In 2007 Aschwin de Wolf launched the cryonics blog Depressed Metabolism, the first professional blog to exclusively cover the science and practice of cryonics. Out of this platform emerged The Institute for Evidence-Based Cryonics (2008-2018), a non-profit aimed at educating the general public about cryonics. The Institute organized a number of groundbreaking symposiums on cryonics and dementia and cryonics revival scenarios. The Evidence-Based Cryonics Institute website also became the official host of the Scientist’s Open Letter on Cryonics and engaged in several campaigns to draw attention to recent breakthroughs in brain cryopreservation. Biostasis continues the journey that started with Depressed Metabolism and the Institute for Evidence-Based Cryonics. Its goal remains to educate the general public about cryonics and human biostasis in all its aspects. We will keep publishing new content and historical documents relating to cryonics and remain the official host of the Scientist’s Open Letter on Cryonics. This year we will also announce the publication of the first detailed medical human biostasis protocol that will allow hospitals to educate themselves about offering cryonics as an elective medical procedure. In 2019 we will also announce a series of initiatives to study the theoretical aspects of conducting cell repairs at low-temperatures, or medical cryobotics. All entries from the depressed metabolism and evidence-based cryonics website remain available on the biostasis website. Please update your links and spread the word about biostasis.com. The enemies of a good cryonics case are time and temperature. Deployment of a standby team that can start rapid cooling upon circulatory arrest should take care of the temperature challenge. The time element is more challenging. Even if a patient is stabilized rapidly after pronouncement of legal death, logistical and legal challenges can interfere with timely transport to Alcor for subsequent procedures. For example, if a patient is rapidly cooled down in North Dakota but logistical challenges and flight schedules prevent arrival of the patient at Alcor until several days later, the patient will still be subjected to progressive deterioration of the fine structure of the brain, breakdown of the blood brain barrier, swelling, and a number of processes that prevent smooth cryoprotection of the brain, or even necessitate a “straight freeze” (cryopreservation without a cryoprotectant). How should Alcor deal with the challenge of having only one physical location in Arizona but being responsible for members all over the world? The most obvious solution is for a terminal member to move to Alcor. In almost all cases this is the preferred solution because this prevents several potential logistical, legal, and technical challenges. The advantages of moving to Alcor are so great for both the cryonics organization and the patient that Alcor offers up to $10,000 in relocation assistance. To further incentivize such a choice, Alcor could consider further increasing the amount of relocation assistance and/or actively assist older and sick members to consider relocating. Another solution is to bring all major Alcor procedures to the location of the patient. This is easier said than done. Whereas a patient relocation does not require major expenditures and logistical decisions on the part of Alcor, bringing cryoprotection to the patient is a non-trivial task because it entails performing Alcor’s operating room procedures at a remote location. In practice, this can be done, and Alcor has cautiously authorized “field cryoprotection” for overseas and selected US cases. In principle field cryoprotection is possible for both neuro-patients and whole body patients but true whole body field cryoprotection would require the creation of an adequately equipped vehicle or satellite facility, not to speak of medical expertise. Recognition of the fact that many Alcor members do not relocate when terminally ill, and potential cost savings, have prompted some Alcor officials to advocate expanding field cryoprotection to more members. Since it is obviously easier to bring a patient to a hospital than a hospital to a patient, more effort will need to be spent in educating members of the advantages of timely relocation to the Scottsdale area. There might be one route to bringing the hospital to the patient and that is to encourage the creation of several of “cryonics hubs” in areas with large numbers of Alcor members. Support and recognition from Alcor for such initiatives is necessary but a decentralized approach could be effective here. Local members can start with creating a cryonics infrastructure to assist professional standby teams. Such efforts can include maintaining a list of pertinent local regulations, cooperating funeral homes, local volunteers and medical professionals, and flight schedules. A more ambitious step would be to equip certain areas with a local rescue vehicle, as was done in the past in Southern California. A more ambitious step would be to equip such a vehicle for field cryoprotection or even set up such facilities in a cooperating funeral home or building. This is a formidable task that would require many hours of work and considerable expenses but it would produce a more robust response infrastructure for Alcor to utilize. It could also make some areas less vulnerable to episodes of deteriorating response capabilities at Alcor. Last but not least, bringing people together to engage in such a project will also tighten the social fabric and local visibility of cryonics. Cryonics has limited appeal but cryonics organizations have assumed global responsibility to cryopreserve their members timely and competently. A hybrid model in which local members and volunteers work together with medical staff members and contractors to deliver the best possible cryonics care is the best answer to this situation. Taking Alcor as an example, what does this model entail in terms of infrastructure and staffing? The most important response mandate of a cryonics organization is to ensure competent local response capabilities through full-time employment of medical professionals and cryonics experts at the facility. Unlike remote response capabilities, Alcor’s response to local cases should not be dependent on erratic, case-by-case, contracting with local medical professionals. While such professionals can supplement Alcor’s own capabilities, Alcor should never find itself in a situation where it cannot deploy an effective standby due to a shortage of available staff members. This mandate requires that Alcor’s staffing policy cannot be allowed to outcrowd its local response capabilities. In practice, this means having at least three staff members available for local case work with at least two of them being proficient (and preferably certified) in conducting medical procedures that are elemental to cryonics stabilization (placing IV lines, placing an endotracheal tube etc.). A strong mandate to primarily deliver state-of-the-art care in the Scottsdale area may look rather meager in light of its global responsibilities, but considering the fact most Alcor members do not die suddenly, and are eligible for an attractive Alcor relocation-reimbursement, out-of-state cases may increasingly be seen as reflecting choices made by Alcor members, as opposed to inevitable events happening to them. The significantly higher costs, and potential logistical and legal complications, of out-of-state cases are a strong argument to further increase Alcor’s relocation reimbursement amount. The next layer is to coordinate a network of professional cryonics response providers (such as Suspended Animation and ICE) and local groups to respond effectively to out-of-state cases. Such companies can provide a valuable element to deliver rapid response provided that access to such services does not lead to allowing the atrophy of local groups and response capabilities. Professional standby companies usually deploy out of a single state (or two at most), which means that relying on local capabilities created by members remains an essential component for responding timely to time-sensitive cases. To ensure consistent and competent non-local response coverage, the coordination and monitoring of non-local response capabilities should be an important job responsibility of a full-time Alcor staff member. To augment the services of cryonics standby organizations and the resources available to local members, regions with substantial numbers of Alcor members should be encouraged and supported in creating robust physical cryonics responsibilities. In such areas, maintenance of a full set of standby kits, a response vehicle, and even on-site field cryoprotection capabilities should be pursued. These non-Scottsdale cryonics “hubs” should be allowed some degree of autonomy, provided their efforts conform with Alcor’s protocols and standards. Further enhancement of these cryonics hubs can be reaped if such efforts are supported by other cryonics-supporting activities such as research and public outreach. Examples of areas where such hubs would be feasible and desirable include New York City, Los Angeles, and San Francisco. The mandate for these areas should be to close the gap between Scottsdale-based cases and local cases. Why Don’t You Start With Standby First? In the 15 years I have been involved in cryonics I have observed a predictable pattern. An enthusiastic group of people want to create a new cryonics organization. Reasons can range from wanting to have a cryonics organization in their own continent or country (Europe, Australia) to having a distinctly different vision how cryonics should be practiced. Some of these attempts have succeeded and others have failed. The common denominator I have seen in the failed attempts is to do “something else” first before offering long-term maintenance. If this “something else” would simply comprise exercising due diligence in having a sensible financial and legal framework in place before accepting patients that is understandable. But here “something else” concerns achieving something even harder as a precondition for building a storage facility: creating state-of-the-art response capabilities. One argument for this approach is that without adequate standby and stabilization having a cryonics storage facility is pointless. I do not think this is true and if this argument is followed to its logical conclusion there will never be a good moment to start offering storage as long as cryonics is as unpopular as it is right now. Sure, it is indisputable that a cryonics patient who receives a prompt response and good stabilization procedures will sustain less damage and better cryoprotection. This does not mean, however, that anything that falls short of this is doomed. The ultrastructure of the post-mortem brain is more robust than even most cryonicists assume and ice formation does not necessarily render the original structure of the brain un-inferable. The other argument is often a variant on the idea that the most challenging element of a cryonics endeavour (i.e. storage) should be done last. But the hardest part of cryonics is not storage but standby. Creating cost-effective, dependable, responsible capabilities for a region larger than a city or small country is a non-trivial challenge. Let’s consider Europe for example. Providing standby coverage for all countries would require a massive initial investment with numerous medical professionals on retainers being available for a case at the right time at the right place…a case which may not happen for many years. Will such an organization be able to keep its supporters motivated and financially committed? In reality this mandate often creates a situation where the organization cannot live up to its standby claims, storage is (indefinitely) postponed, and interest wanes until the next attempt is made to do the same thing. It is no surprise, in my opinion, that some of the newer cryonics organizations (KrioRus, Oregon Cryonics) accepted patients for long term care from the get-go. Standby is important and I do not pretend that it will take care of itself when there is storage. But whereas storage needs to be centralized (having a storage facility in each of the European countries at this point would be ludicrous) having sound and dependable standby capabilities is a decentralized process which can be pursued by different groups in different states or countries based on their different needs and (financial resources). As we speak, the UK and the Netherlands have made impressive efforts to create such capabilities and these efforts will further grow and spread when there is a facility with patients to care for. One needs to start somewhere and the most realistic path is to first create a sensible storage solution followed by de-centralized efforts to transport patients to the facility in the best possible condition. Ralph Merkle’s new article “Revival of Alcor Patients” constitutes an important contribution to the growing cryonics survival literature. What sets Merkle’s latest piece apart from (his) prior efforts is its extensive treatment of the validation of revival attempts (“did we do it right?”) and the ethical principles of revival. The most important distinction between revival methodologies concerns those that involve in-situ repair and revival and those that aim for repair and revival on a different substrate (i.e. “mind uploading”) after conducting a (molecular) scan. Merkle also presents a revival scenario that involves a destructive scan of the cryopreserved individual, followed by in-silico repair, and biological revival. Some cryonicists (including the “godfather” of cryonics, Robert Ettinger) have expressed concerns that some of these proposals will not produce meaningful individual survival. In particular, it is argued that “running” a complete simulation of the brain on a computer won’t give rise to consciousness, let alone produce individual survival. Since it may be quite some time before technology is at a state to favor one position over the other, we need sound principles to make prudent decisions now. In his article “Brain Preservation and Personal Survival: The Importance of Promoting Cryonics-Specific Research” (Cryonics magazine, November-December, 2017), Alexandre Erler introduces a new kind of “wager” to make such decisions when faced with philosophical uncertainty concerning the nature of identity and consciousness. The use of Pascal-style “wagers” is nothing new in cryonics. The most famous wager was proposed by Ralph Merkle himself to compare the potential outcomes for an individual who faces a choice between signing up for cryonics or not. “Merkle’s Wager” consists of a matrix of four choices: Sign up and it works; sign up and it doesn’t work; don’t sign up and it works; don’t sign up and it doesn’t work. Merkle concludes that signing up for cryonics is the favored rational option. Michael O’Neil and Aschwin de Wolf extended this wager to making a choice between neuropreservation and whole body cryopreservation in their “The Case for Whole Body Cryopreservation” article (Cryonics magazine, expanded version, June 2014). Most readers may not be too concerned about the loss of identity-critical information in either cryopreservation option but being wrong on the nature of consciousness could be fatal. If consciousness is substrate-dependent and/or destroying the original brain (during a scan) excludes personal survival, choosing a wrong revival method can produce certain death, despite having received an excellent cryopreservation. Erler simply asks the question what would be the prudent choice to make given that we cannot know with certainty (right now) which philosophical position is right. The short answer is that in-situ repair and revival of the preserved brain (or whole organism) will give rise to individual survival regardless of which philosophical view is correct. One thing that is important to emphasize here, which is also discussed in Ralph’s repair article, is that non-destructive (molecular) scans of some kind and in-silico repair may still be a necessary step for in-situ biological repair and revival. The conservative position on revival is limited to the claim that it would not be prudent to instruct the cryonics organization to discard the original brain and seek revival by “running” that model on a computer. Alcor allows for members to express their revival preferences. One complex question is whether it is currently possible to give informed consent for a revival scenario other than in-situ biological repair. A related question is to what degree cryonics organizations should honor requests for enhancements during the revival process, especially if these requests are (then) known to produce substantial identity-altering effects. There has been little in-depth discussion of these topics to date. What is Cryonics First Aid? First aid in medicine is defined as “the assistance given to any person suffering a sudden illness or injury, with care provided to preserve life, prevent the condition from worsening, or to promote recovery.” Its aims can be summed up as the three P’s: preserve life, prevent further harm, and promote recovery. With the exception of the aim of “promoting recovery” this framework is applicable to cryonics, too. The rationale for allowing laypersons to provide basic medical procedures rests on the recognition that the health condition of a person can rapidly change and/or professional responders may be unable get to the patient in a timely fashion. A major difference between mainstream medicine and cryonics, however, is that in cryonics there often is no local professional response team that can deploy quickly to stabilize the patient. As a consequence, one would expect to see more situations in which the initial, or even all, aspects of a cryonics case will need to be done by local volunteers—and that is exactly what has been observed. This does not necessarily indicate a deficiency on the part of professional cryonics standby organizations. Cryonics is simply not big enough to have professional response teams in every state and major city. The objective of professional cryonics standby teams and cryonics first aid are the same: stabilize the condition of the patient. What sets cryonics first aid apart from the comprehensive protocols of professional standby organizations is the degree to which this objective can be accomplished and the equipment used. Cryonics first response entails three procedures: cooling, circulation, and medications administration. One clear advantage that cryonics first aid responders have is that our most effective procedure, cooling, is also the easiest to implement. What usually sets good cryonics first aid apart from suboptimal cryonics first aid is the efficiency of cooling achieved and whether induction of hypothermia is augmented by chest compressions and medications administration. When cryonics first aid is done competently response time is fast, cooling rates are fast, circulation is restored, and a basic medications protocol to prevent clotting, brain injury, and swelling is administered. The topic of cryonics first aid has not received as much attention as other topics in cryonics. In the early days of cryonics it did not make sense to draw a distinction between cryonics first aid and advanced procedures because all procedures were done by (trained) volunteers. And later, when professional cryonics standby organizations were formed, the topic also received little attention because it was not sufficiently recognized that there would still be a large role to play for local cryonics groups in the provision of cryonics procedures. It is only now when we have come to appreciate the advantages of a “hybrid” standby model in which local team members provide first aid, or interact with professional standby organizations, that there is a need to clearly define the objectives, scope, and physical infrastructure associated with cryonics first aid. Some of the current questions about cryonics first aid that Alcor seeks to address include: What is the exact cryonics first aid protocol? Which items should be in a cryonics first aid kit? Should cryonics first aid kits be available to groups or also to individual members? What makes a local group eligible for a full set of standby kits instead of a first aid kit? What will cryonics first aid training comprise? What is the difference between Alcor’s first aid protocol and Alcor’s abbreviated protocol designed for professional standby teams in case of a delayed response? How do professional standby teams such as ICE and SA interact with local cryonics first aid responders? Should first aid capabilities be enhanced in areas with many members and an active local community? A hybrid model for standby? In 2003 Charles Platt organized a week-long standby training in Arizona to teach a gathering of long-time and new Alcor members basic and advanced standby procedures. This well-attended meeting was one of the most ambitious gatherings to educate U.S. and international Alcor members in the knowledge and skills to participate in a case, from communicating with hospital staff to remote blood washout. Retrospectively, the timing of this event was problematic. For right then there were two ongoing developments that would largely render this model of doing cryonics procedures obsolete: the creation of Suspended Animation in Florida and the hiring of medical professionals at Alcor. The rationale behind this transition is eminently understandable. If resources permit, why not run cryonics cases with medical professionals instead of motivated members and volunteers? If cryonics is a medical procedure, should it not also be conducted by medical professionals? As we look back on the rise of medical contracting in cryonics, however, I think some caveats and sobering observations should be made. enough medical professionals (who often are meaningfully employed elsewhere) can be at the bedside at the right time. In addition, medical professionals may have the skillsets to perform a subset of cryonics procedures but not all elements of a cryonics case are routinely taught in medicine. Case reports sometimes reveal a lack of understanding about the rationale of cryonics procedures and how to prioritize them in specific circumstances. Engaging medical contractors in extensive education about cryonics procedures and its subtleties is necessary but time-consuming and costly. One unfortunate consequence of the medical professional contractor model of cryonics is that it can lead to the decline of member engagement in casework, neglected readiness resources and people at the main cryonics organization, and the atrophy of local cryonics groups. Cryonics organizations are especially vulnerable to this outcome when they agree to exclusively contract with an organization for their standbys. This is quite troubling from a community perspective but it also threatens the basic local standby infrastructure that that even professional standby organizations often need to draw upon to be effective. In mainstream medicine there is a need for non-professionals to perform “first aid” before professionals arrive. In cryonics there is an even stronger need for such “first aid” because the professionals often are deployed out-of-state and may arrive too late. In such cases, local cryonics first aid responders will be forced to conduct the most important stabilization procedures such as rapid cooling and circulation. If professional standby organizations are not willing to take “post-mortem” cases, a compromised local cryonics infrastructure can be (literally) deadly. What I want to propose here is to move toward a “hybrid” model of cryonics standby. The first layer of such a standby is the employment of several medical professionals at the cryonics organization who remain available for local and remote casework. The next layer is the establishment (or rejuvenation) of vibrant local member groups that can do basic cryonics first aid procedures and aid the cryonics organization or contract standby organizations. The third layer is to have in place a number of non-exclusive contracts with professional standby organizations to conduct casework or assist in Alcor-run cases. When this hybrid model is pursued with accountability and sound quality control, the benefits of both models of cryonics can be reaped. The Brain Preservation Foundation’s mission to validate structural preservation of the brain has been very successful but the link with mind uploading as a means of personal survival raises some important questions. Alexandre Erler makes the case for a distinct cryonics research program based on biological survival. As someone who is fully supportive of the ultimate goals of the cryonics enterprise, but still views the current state of the practice with some degree of skepticism, I make a point of acquainting myself with the latest evidence regarding the quality of cryonics procedures and their ability to preserve the foundations of a person’s identity through time. Over the past two years or so, I have increasingly seen a recent achievement by 21st-Century Medicine (21CM) cited by some cryonics supporters as demonstrating the scientific validity of those procedures: namely 21CM’s research on aldehyde-stabilized cryopreservation (ASC). This new technique has allowed them to win, in 2016, the Small Mammal Prize, and just this year, the full Technology Prize awarded by the Brain Preservation Foundation (BPF), by demonstrating excellent preservation of the ultrastructure in, respectively, a whole rabbit brain (McIntyre and Fahy, 2015) and a whole pig brain (The Brain Preservation Foundation, 2018). Were I to follow this line of reasoning, I could happily set aside my concerns about the adequacy of today’s cryopreservation procedures, which had now been verified by scientific experts; the proper focus would now need to be on how to responsibly introduce those procedures into a clinical setting, for patients at the end of their lives who might request them. It turns out, however, that things are not so simple. ASC is no doubt a step forward for the field of brain banking, and as its name indicates, it it is indeed a form of cryopreservation, since it involves vitrification of the brain at -135 °C. Nonetheless, ASC does not count as cryonics, insofar as it uses a fixative solution prior to vitrification and cooling, which could potentially preclude revival of the original biological brain (an essential part of cryonics as traditionally understood). And indeed, biological revival with the help of future technology is not a priority for the BPF’s president, Dr Kenneth Hayworth. Rather, he envisages brain preservation as conducive to life extension via mind uploading: a process that would involve cutting the preserved brain into thin slices, scanning each slice, and feeding the resulting data to an advanced computer that would thereby be able to map out the entire network of neural connections in the person’s original brain, and ultimately to emulate that person’s mind (Hayworth, 2010). This is quite different from cryonics. Assuming that a technique like ASC is compatible with mind uploading, but not with the revival of the original brain, it should not be treated as a landmark in cryonics research. Admittedly, there is some uncertainty about the truth of that assumption. It seems at least conceivable that the chemical cross-links created by the fixation process could be reversed, and the original brain revived, using future technology. Nonetheless, ASC introduces empirical and philosophical uncertainties (e.g. could we really restore, as opposed to recreating, the original neural structure following the various molecular changes involved?) to a much greater degree than traditional cryonics does. But why, it might be asked, should one remained fixated on pursuing biological revival via cryonics, if the evidence in favour of good ultrastructure preservation is better for ASC than it is for contemporary cryonics procedures? It is for instance known that, up to now, 21CM’s cryonics protocol involving the use of cryoprotectant M22 has been causing the brain to shrink to almost 50% of its natural size due to osmotic dehydration, hindering our ability to establish the quality of ultrastructure preservation using electron microscopy (The Brain Preservation Foundation, n.d.; De Wolf, 2017). If so, why not join the BPF in focusing simply on the type of brain preservation that seems to yield the best evidence of success, even if this means turning away from cryonics towards mind uploading? In what follows, I will argue that, given the current state of our scientific and philosophical knowledge, doing so would be irresponsible. The BPF’s commitment to holding brain preservation research to the highest standards of scientific rigour is laudable, and worth emulating. Nonetheless, for those interested in brain preservation with a view to enabling life extension, supporting cryonics-specific research remains the safer bet. We should not simply rely on the BPF’s approach if our goal is to try and save those whom medicine in its current state cannot restore to life and health. To see why this is so, let us begin by noting the two main philosophical theories of personal identity through time that are relevant when discussing the respective merits of cryonics and mind uploading in this context. The first one, which we can call the “Physical Continuity” (PhyCon) theory, asserts that a person is identical with the physical substratum from which her mind emerges: that is to say, her brain, with its intricate web of neurons and synaptic connections. (For a good exposition of the theory, see e.g. McMahan, 2002.) According to this theory, saving a person from destruction after she has been pronounced dead requires preserving enough of her brain, in a state in which that brain retains at least its potential for viability. What exactly counts as “enough” of the brain is of course a difficult question that would deserve much more discussion. While we can safely say that, all else being equal, it is always preferable to preserve as much of the original brain as we can, the survival of the person arguably does not require perfect preservation. Intuitively, people can survive limited forms of brain damage, such as those caused by strokes. What is more, as cryonicists have pointed out, brain damage that causes significant disability today might no longer be a serious problem (as long as it is limited enough not to undermine personal identity) in a future where cryonic revival has become possible, as the technological means will then likely exist to fully repair that damage, e.g. based on inferences from the state of the person’s brain prior to repair. The second relevant theory can be referred to as the “Psychological Continuity” (PsyCon) theory. Roughly speaking, it says that you are to identical with the set of psychological features (memories, beliefs, desires, personality traits, etc.) that constitutes your mind. On this view, preserving you after you have been pronounced dead requires ensuring the persistence of enough of those psychological features, in an embodied mind of some sort (but one that need not be embodied in your current biological brain). One variant of PsyCon, endorsed by many supporters of mind uploading including Hayworth, states that preserving a person after legal death requires preserving her connectome, understood as the mapping of neural circuitry encoding one’s memories, skills, and other psychological features – that is to say, the connectome as an informational entity rather than a physical one (Hayworth, 2010), even though the information in question will by necessity be stored in some physical substratum, whether a brain or a computer. Like virtually all philosophical theories, both the PhyCon and PsyCon theories have their partisans and detractors. PhyCon, for instance, has been said to imply that there is a fundamental difference between a scenario in which a person had her brain suddenly destroyed and replaced by an exact copy of it, perhaps produced via scanning and 3D printing using neurons as basic material; and a scenario in which the person’s brain cells were gradually replaced by new ones over an extended period of time, in the same way as the rest of the human body regularly regenerates itself. While most PhyCon theorists would agree that the second scenario is compatible with the preservation of the person’s identity through time, they will deny that the first is – if the original brain gets destroyed, they will say, so must the person as well, and the new replica brain must belong to a new person not numerically identical with the first one. Some find this difference of treatment between the two scenarios arbitrary (e.g. Parfit, 1984). Some versions of PsyCon, on the other hand, imply that multiple copies of yourself could all be you. Indeed, suppose that after scanning your brain to obtain a map of your connectome, we then created two identical copies of your mind running on two different computers. Since both copies would demonstrate the same degree of psychological continuity with your previous self, we would have to conclude that both are you – something many find intuitively unacceptable. Other versions of PsyCon strive to avoid that implication by stipulating that you are only identical with an upload of your mind if no more than one copy of it has been created, yet this move leads to other philosophical problems. Hayworth, however, happily endorses the implication that multiple copies of a single individual can co-exist at the same time, and contends that those who object to that implication are simply confused (Hayworth, 2010). For the record, I personally find PhyCon more plausible than PsyCon (although I also agree that the preservation of one’s psychological features after cryonic revival is highly desirable, regardless of its significance for sheer survival). On that basis, I do not support further animal research targeted exclusively at the development of mind uploading technology. However, my personal opinion on the matter can be set aside for the sake of the present discussion. The important fact is that there are reasonable, honest and intelligent people on both sides of that debate, and that neither side has so far managed to present arguments that would convince all reasonable people on the other side. In such a situation, the intellectually responsible path to take is surely to eschew certainty, and acknowledge that the other side could be right, even if one thinks that this is unlikely and that the arguments favoring one’s own position are very strong. If that is the case, what is the prudent choice to make for those who wish to promote life extension through brain preservation? I submit that traditional cryonics is the more prudent option to pursue. (This remark could be extended to ASC if one could show that it is in principle compatible with the revival of the original brain, and provided that it is not combined with destructive mind uploading.) This can be demonstrated using a simple argument that considers what the implications are if we assume that PhyCon and, respectively, PsyCon are true. Suppose first that PhyCon is true. If so, a cryonics procedure carried out properly will save a person’s life, whereas using a technique like ASC that compromises the brain’s potential for viability, followed by destructive scanning and uploading, will kill that person. If PsyCon is true, on the other hand, both methods can ensure survival. Indeed, adequate cryonic preservation of a person’s brain would also preserve the ultrastructure grounding the various psychological features that defined that person. Insofar as traditional cryonics (at least once sufficiently perfected) can secure survival whether PhyCon or PsyCon is true, whereas mind uploading of the kind envisaged by the BPF can only do so if PsyCon is correct, traditional cryonics is the safest bet. This conclusion is reinforced by the fact that the success of mind uploading at securing personal survival might depend on an additional factor, namely the possibility of creating conscious or sentient machines. If, for whatever reason, computers – which, unlike biological brains, rely on hardware rather than “wetware” – happen to fundamentally lack the capacity for consciouness, regardless of how powerful and sophisticated they might be, then uploads turn out to be no more than computer “zombies” mimicking now deceased people. It’s unclear that someone could “survive” as such an entity. And even if we assume that they could, the value of such survival, devoid of the conscious experiences that make our lives worth living, would be dubious, somewhat like the value of surviving with only a brain stem. This point about machine consciousness equally applies to the idea of a “Moravec transfer”, i.e. a procedure involving gradually uploading a person’s mind to a computer (neuron by neuron if necessary), unlike the BPF’s proposed method (Moravec, 1988). Traditional cryonics, by contrast, can succeed at preserving a person regardless of whether or not computers can be conscious. Hayworth would presumably deny that any such doubts about the possibility of machine consciousness are legitimate. Indeed, he seems to confidently embrace the so-called computational theory of consciousness, according to which consciousness is fundamentally the product of – highly complex – computation, which we know computers to be capable of at least in principle (e.g. Hayworth, 2015). However, there is currently no general agreement among philosophers of mind or neuroscientists that the computational theory of consciousness is correct, and Hayworth does not demonstrate that it is (although he dogmatically equates the idea that there might be physical properties required for the production of conscious experience which are found in wetware, but not computer hardware, with invoking “magic”). Furthermore, even if taken for granted, the computational theory of consciousness cannot, absent additional philosophical arguments, show mind uploading to be consistent with personal survival. Assuming that R2-D2 from Star Wars is conscious does not commit us to accepting that a perfect replica of R2-D2 built from fresh parts, after – let us assume – it was destroyed by the Empire’s forces, is numerically identical with the original robot. In response, Hayworth could perhaps abandon PsyCon and instead invoke the claim, famously defended by philosopher Derek Parfit, that personal identity does not actually matter in the way many of us tend to think – rather, psychological continuity is what really matters (Parfit, 1984). (In his reply to an article by neuroscientist Michael Hendricks critical of cryonics, Hayworth actually appears to move in that direction: see Hayworth, 2015.) However, besides the fact that this is again a controversial philosophical view, it notably led Parfit to dissociate psychological continuity from personal survival, and to conclude that the latter was, in itself, also overrated. This position is very much at odds with the life extension project, which the BPF claims to be pursuing. I cannot but see some irony in the fact that Hayworth, the author of an essay titled “Killed by Bad Philosophy”, should show a degree of overconfidence in his philosophical views that might potentially lead his followers to experience the very same outcome his essay is warning against. (a) Incentive prizes. Such prizes are a powerful tool for stimulating research, particularly in neglected areas of science. Unfortunately (and perhaps unsurprisingly, given Hayworth’s philosophical beliefs), the BPF does not at this point appear inclined to set up any new prize that would include a requirement to preserve the brain’s potential for viability. On the basis of the arguments I have provided so far, I submit that the institution of a prize (possibly crowdfunded) incorporating that requirement would be highly desirable. How demanding such an incentive prize should be with regards to the winning entry is a matter for further debate. A relatively modest version would require demonstrating adequate ultrastructure preservation in a small mammalian brain, but using a procedure that could in principle be reversed by future technology, making it possible for the original brain to eventually be “re-started”. However, based on a recent talk by Dr Greg Fahy from 21CM, which I attended in May 2017 at the International Longevity and Cryopreservation Summit in Madrid, such a goal may soon be achieved. Indeed, Dr Fahy reported having found a way to largely overcome the abovementioned problem of dehydration and shrinking that has so far prevented a proper assessment of the quality of ultrastructure preservation offered by traditional cryonics protocols (e.g. using M22). Assuming Fahy has now reached that milestone (and I look forward to the publication of his paper on the topic), one could set up a prize with a more ambitious goal: for instance, one could add that besides showing good ultrastructure preservation and retaining the preserved brain’s potential for viability, one should also demonstrate actual viability, say via measurable electrical activity, either at the level of the whole brain or in slices obtained from that brain. Ultimately, the details of such a prize should be worked out by scientists with the relevant expertise (as long as the constraints I have outlined here are respected). Those who believe that ASC holds greater promise could support a prize rewarding the first team who found a way to reverse the fixative process involved in that procedure, and restore the original neural structure. (b) Research funds. Such a fund, which could also be crowdfunded, would be managed in a transparent manner by an organization committed to promoting cryonics-specific research. In accordance with standard practice when it comes to funding scientific research, project proposals would be solicited from active researchers in cryobiology (and other relevant fields), and a committee of experts would select the proposals that it deemed most worthy of funding. The organization would then help disseminate the results of the completed projects (e.g. as laid out in peer-reviewed publications). The scientific experts tasked with evaluating the submissions for either an incentive prize or a research fund should ideally be publicly identified, and sufficiently independent of both the authors of the submissions and of cryonics companies (e.g. they should not be receiving research funding from those companies). Furthermore, while an organization that might implement solution a) or b) could be created de novo, existing institutions might already be able to fulfill that role. One example would be the UK Cryonics and Cryopreservation Research Network (http://cryonics-research.org.uk), led by Dr João Pedro de Magalhães, who has connections with other scientific experts, including Ken Hayworth. Despite the scientific rigour with which it approaches the issue of cryonics, the network is currently underfunded. While most people may understandably not be able to commit substantial amounts of resources to supporting cryonics research, the success that the BPF has enjoyed so far with its incentive prizes demonstrates that large numbers of even small donations can foster impressive technical breakthroughs and help strengthen the credibility of research projects of the most audacious sort. I believe it is now time to apply a similar approach to the safer bet of cryonics-specific research. Further raising the public profile of such research, and improving its status in the eyes of the mainstream scientific community, can help promote a virtuous cycle leading in turn to more funding and greater professionalization. The sooner we can make this happen, the better. An earlier version of this article appeared in Cryonics magazine, November-December, 2017. DE WOLF, A. August 21 2017. Cryonics Without Cerebral Dehydration? Evidence-Based Cryonics [Online]. Available from: https://www.biostasis.com/2017/08/21/cryonics-without-cerebral-dehydration/. HAYWORTH, K. 2010. Killed by Bad Philosophy: Why Brain Preservation Followed by Mind Uploading Is a Cure for Death. Available: http://www.brainpreservation.org/content-2/killed-bad-philosophy/. HAYWORTH, K. September 16 2015. Ken Hayworth’s Personal Response to MIT Technology Review Article. Brain Preservation Foundation [Online]. Available from: http://www.brainpreservation.org/ken-hayworths-personal-response-to-mit-technology-review-article/. MCINTYRE, R. L. & FAHY, G. M. 2015. Aldehyde-Stabilized Cryopreservation. Cryobiology, 71, 448-58. MCMAHAN, J. 2002. The Ethics of Killing : Problems at the Margins of Life, Oxford, Oxford University Press. MORAVEC, H. P. 1988. Mind Children : The Future of Robot and Human Intelligence, Cambridge, Mass., Harvard University Press. PARFIT, D. 1984. Reasons and Persons, Oxford, Clarendon Press. THE BRAIN PRESERVATION FOUNDATION. n.d. Overview of 21st Century Medicine’s Cryopreservation for Viability Research [Online]. Available: http://www.brainpreservation.org/21cm-cryopreservation-eval-page/. THE BRAIN PRESERVATION FOUNDATION. 2018. Aldehyde-Stabilized Cryopreservation Wins Final Phase of Brain Preservation Prize [Online]. Available: http://www.prweb.com/releases/prweb15276833.htm. March 13, 2018: A team from 21st Century Medicine has developed a technology that has been published in peer-review and then independently verified to enable near-perfect, long-term structural preservation of a whole, intact, large mammalian brain. This is a truly groundbreaking result and puts the proposition of human medical biostasis as a way to save humans, who otherwise would die, squarely within the realm of what may be possible in the foreseeable future. 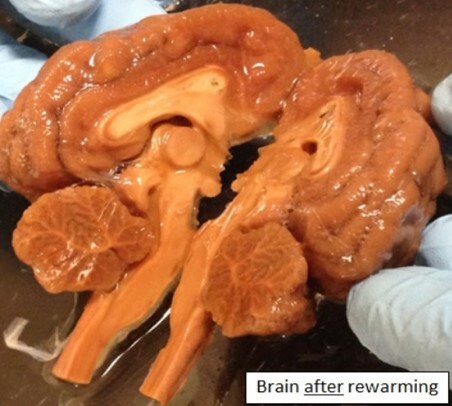 This follows recent scientific evidence that long-term memory is not modified by the process of whole organism cryopreservation and revival in simple animal models. The new breakthrough comes eight years after the Brain Preservation Foundation (BPF) launched the Brain Preservation Prize and today won that very prize. 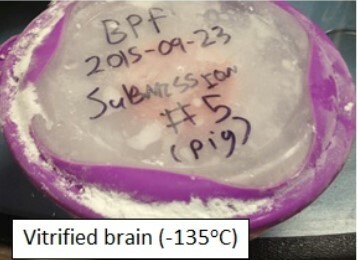 Left Picture: Vitrified pig brain at -135° Celsius (-211° Fahrenheit) – a temperature at which chemical and biological actively virtually has stopped and storage without any change or degradation is possible for centuries if not millennia. Right Picture: Previously vitrified brain after rewarming later subjected to extensive electron microscopic examination, showing that near perfect ultrastructure was preserved. Source: 21st Century Medicine / can also be accesses at BPF here. The last major technological innovation at Alcor was vitrification (cryopreservation without ice formation). Viability assays of brain slices and electron micrographs of brains cryopreserved with vitrification solutions show substantial improvements over the older cryopreservation protocols. But this was almost 20 years ago and it is time for another technological innovation that will improve patient care. I want to suggest that the strongest candidate for such an innovation is to introduce field cryoprotection for all Alcor members. Field cryoprotection aims to close the gap in outcome between patients that are pronounced legally dead in the Scottsdale area (where Alcor is located) and patients that are pronounced legally dead in other US states by conducting the cryoprotective portion of Alcor’s procedure prior to transport to Alcor. Currently the procedure would be to deploy a standby team to the patient’s bedside, start rapid cooling and cardiopulmonary support, replace the blood with an organ preservation solution, and then ship the patient to Alcor for cryoprotection and long term care. Those organ preservation solutions have been designed to counter the adverse effects of cold ischemia but are from for perfect. After about 6 hours of cold ischemia, the brain is rendered non-viable (no EEG can be recovered). Electron micrographs of mammalian brains show that the fine ultrastructure of the brain degrades in a time-dependent manner and blood vessels start to leak. As a general rule, when a patient is shipped to Alcor by air transport the blood brain barrier of the patient has been compromised, which can lead to swelling of the brain during cryoprotection. In whole body patients, substantial abdominal swelling during cryoprotective perfusion occurs, despite remote blood washout. The reason why we call it “field cryoprotection” instead of “field cryopreservation” (or “field vitrification”) is because the patient is not cooled all the way down to liquid nitrogen temperature. While this is theoretically possible (and desirable), the logistics of this procedure are too demanding at this point. So instead of cooling the patient to liquid nitrogen temperature (-196° Celsius) the patient is shipped to Alcor on dry ice (-78.5° Celsius) where further cooldown begins. Research supports this is a safe temperature for shipping patients, provided stabilization and cryoprotection procedures are done timely and competently. From the patient’s perspective the advantages include minimization of cold ischemia, preservation of integrity of the vessels and blood brain barrier, and, under good conditions, cryoprotection can start when the brain is still in a viable state. decrease in costs per case, which can be passed on to the member in the form of lower cryopreservation costs or can be used to eliminate or decrease future increases. During the last couple of years Steve Graber and Hugh Hixon have collaborated to improve neuro field cryoprotection technologies and the gap between conducting cryoprotection in Scottsdale or “on the road” has increasingly been closed. Field cryoprotection procedures are currently only available to neuro members (or for whole body members who agree to neuro-cryoprotection only) but various approaches are currently being discussed to extend this technology to whole body members, too. Field cryoprotection constitutes the next big step in cryonics. Currently only overseas members can benefit from this procedure but the time has come to cautiously extend this procedure to more members. Eliminating water ice shipment in favor of field cryoprotection will be need to be incremental and closely evaluated but the patient care and cost advantages are evident.